What is carotid artery stenting? Carotid artery stenting is a procedure in which your vascular surgeon inserts a slender, metal-mesh tube, called a stent, which expands inside your carotid artery to increase blood flow in areas blocked by plaque. Hardening of the arteries, also known as atherosclerosis, can cause a build-up of plaque. In hardening of the arteries, plaque builds up in the walls of your arteries as you age. As more plaque accumulates, your arteries can narrow and stiffen. Eventually, enough plaque may build up to reduce blood flow through your arteries, or cause blood clots or pieces of plaque to break free and to block the arteries in the brain beyond the plaque. Your carotid arteries are located on each side of your neck and extend from your aorta in your chest to the base of your skull. These arteries supply blood to your brain. 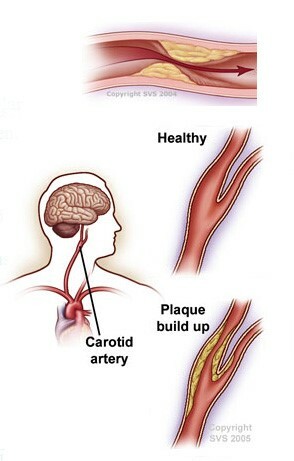 When plaque builds up and reduces blood flow in your carotid arteries, you have carotid artery disease. This is a serious issue because clots can form on the plaque and block the blood flow to your brain. If a clot or plaque blocks the blood flow to your brain, it can cause an ischemic stroke, which can cause brain damage or death. An ischemic stroke is a stroke that occurs because there is a lack of blood flow to cells in the brain. Another related problem that the plaque can cause is an arterial embolism. This occurs when a small piece of plaque or a blood clot breaks away from the site where it formed and blocks another artery downstream. If a clot blocks a tiny artery in the brain, it may cause temporary neurological symptoms, called transient ischemic attacks (TIAs), sometimes called "mini-strokes." A small incision is made in your groin, arm or wrist. A catheter is introduced into an artery in your body through this incision, and the physician advances it to the narrowed part of your carotid artery. Next, a special filter is delivered through the catheter and placed just beyond the narrowed section of the artery. This small filter is part of a system (embolic protection system) designed to catch and remove plaque and other particles that may be released during the procedure. After the embolic protection device is in place, the artery may need to be enlarged to make room for the stent. To do this, the physician places a small, deflated balloon through the catheter to the blocked area of the carotid artery. When the balloon is in the right place, it is inflated. This pushes the plaque build-up aside and reopens the artery to restore blood flow. The balloon is deflated and removed. Then a small metal mesh tube called a stent is placed in the artery and is expanded to prop the artery open and allow blood flow to the brain. After the stent is implanted, a balloon may be inflated inside the stent to better position the stent against the artery wall; then the balloon, filter and catheter are removed. The stent remains in place to help prevent future narrowing of the carotid artery. What do I do on the day? Please present yourself to the Admissions Desk at the relevant hospital. You will be directed to the appropriate ward. Do not drive yourself to or from the hospital, as someone must drive you home from hospital when you have had sedative drugs during on the day. Bring full details of Health Cover I.e. Private Health Insurance, Pensioner Health Benefit Card, Health Care Card, Medicare card or Repatriation Card. Bring a bag of personal items in case you need to stay in hospital overnight. Can I eat and drink before my test? If your carotid stenting is booked for the morning, do not eat or drink after midnight (morning medication can he taken with a sip of water) If you are booked for the afternoon, fast from 10am. Do I take my medications on the day of the test? Yes, and bring all your normal medications to hospital with you. If you are taking blood thinning tablets (anticoagulants), including Warfarin, Coumadin, Marevan or Dindevan, your doctor will tell you if you are to stop these and when. If you have not been told, ask your cardiologist by ringing The Cardiac Centre on (07) 5591 6774. Please continue taking all other medications including Aspirin. Carotid stenting patients requires aspirin therapy and another drug called clopidogrel known as Iscover or Plavix, you will be advised by your cardiologist if you need this drug and a script filled out for you in hospital. If you are diabetic do not take your morning Insulin/diabetic tablets, but bring your medication with you. If you are on Metformin (Diabex, Diaformin) do not take this the day before or the day of the angiogram. You will be taken into an angiographic suite or catheterization lab and moved onto an x-ray table. In most cases, the procedure will be done through the femoral artery in your leg. To prepare for the incision, your entry site (groin, arm or wrist) will be washed, shaved and covered with a sterile sheet. You will be injected with a local anaesthetic to numb the area where the catheters will be inserted. After the initial sting, you may feel a brief warm sensation as the medicine is injected. Your physician will insert a needle into your groin, arm or wrist to introduce the catheter into your artery. Your physician will inject contrast dye into the catheter. This helps the physician see the arteries in your neck and brain on a monitor. You may feel warm or flushed for a short time. Your physician will insert the embolic protection system. Your physician may inflate the artery at the diseased site with a balloon catheter to open the artery for easier placement of the stent. Your physician will insert the stent, guide it to the narrowed area and open the stent to cover the diseased site. Your physician may insert a balloon catheter into the stent to open it wider, then deflate the balloon and remove it. The stent will remain in place to keep the artery open. Your physician will take out the embolic protection system and the catheter. Carotid stenting can be completed within 30 minutes or can take up to 2 hours if the artery to be stented is difficult to access. There are risks with carotid stenting. The main risk is of causing stroke during the stenting procedure. This occurs in between 2% and 10% of all carotid stenting procedures carried out. The risk of using carotid stenting to widen the artery is similar to the risk of having surgery (carotid endarterectomy). Carotid stenting would only be recommended when doctors believe patients are less likely to be at risk than if they had surgery. Dissection (separation of the layers of the artery wall). This can occur in the groin or in the carotid artery. Contrast medium can be damaging to kidneys, particularly in people who already have poorly functioning kidneys. Occasionally, people can be allergic to the contrast material. Occasionally, the artery that has been stented narrows again. This will be checked at the time the patient has follow-up imaging. If this occurs, the procedure can be repeated, and the area can be re-stretched with a balloon. People should fully explore the benefits and risks before having this procedure. This can be done by asking the doctor who will carry out the procedure. What happens after my test? If the carotid stenting is done from the wrist the tube will be removed immediately after the procedure and a small tourniquet applied, you can sit up and eat and drink immediately. If the carotid stenting has been performed from the groin you will be taken into the Recovery Area where the tube from the groin will be removed and a nurse will press on the artery for 10-15 minutes. You will need to lie flat for two hours, keeping your leg straight, to minimize bruising in the groin. Or often a collagen plug is inserted under the skin prior to removing the tube. This plug will dissolve over the next 90 days, you will be able to sit up shortly. Next you will need to sit up for a further two hours, and drink plenty of fluids to flush the kidneys. You should then be able to go home. Once at home you should rest by lying with your legs slightly elevated for the rest of the day. You can perform light activities the next day, but should avoid heavy physical lifting or strenuous activity for five days. If you have gone on to have an angioplasty you will be moved from the Recovery Area to the Coronary Care Unit for overnight monitoring of your heart. You will usually go home the following day. How will I get my results? The specialist doctor who carried out the carotid stenting will tell you and any family or others as you dictate the outcome of the procedure immediately or as soon as possible after it is completed. Ongoing treatment will also be discussed and the need for any further follow up. Your referring doctor and local doctor will often get the results by fax that day and a completed letter sent to arrive for them within 5 working days. You are advised to rest quietly at home following your procedure. Your cardiologist will advise you when you may resume your normal activities. Avoid straining and lifting any heavy objects for the first few days following your procedure to avoid the risk of injuring the puncture site before it has had sufficient time to heal. Remove the small plastic dressing over the puncture site the day after the procedure if it has not been removed already. Resume your usual diet and fluid intake. Resume your usual medications. If your groin wound starts to bleed or swell, lie flat and ask the responsible adult with you to press firmly on the site for 10 minutes. Should this occur, please ring your doctor. If the angiogram was performed from the wrist sometimes the forearm or your wrist may ache or be quite painful a week after discharge, this is not uncommon, please use analgesia as needed, especially at night. Should you have any concerns or require further information immediately following discharge, please contact The Cardiac Centre (07) 5591 6774 between 9:00am and 5:00pm, Monday to Friday. If it is an emergency call 000 for an ambulance.